Granit Xhaka spoke after his side's 1-0 victory over Watford at Vicarage Road. 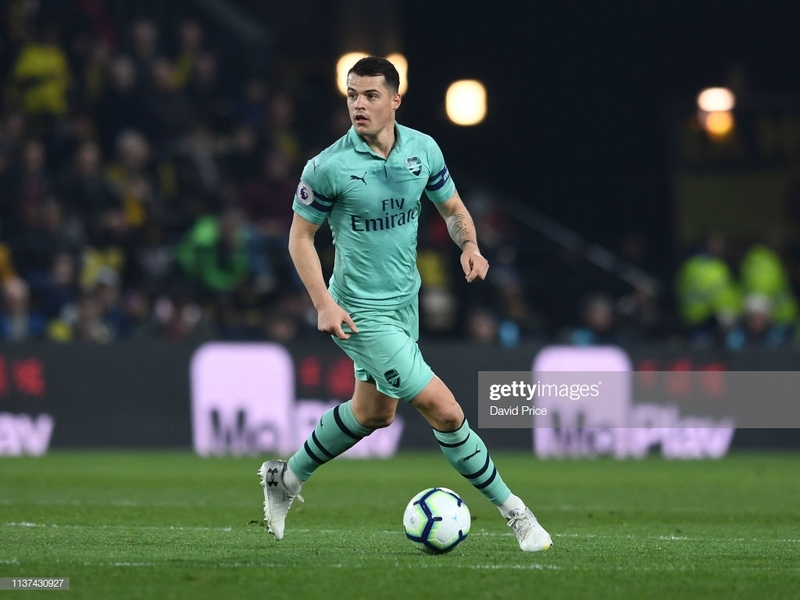 Granit Xhaka starred in Arsenal's 1-0 victory over Watford at Vicarage Road on Monday night. A ninth-minute goal from Pierre-Emerick Aubameyang was enough to give the Gunners victory over the Hornets. Watford though had to play almost 80 minutes with ten men after captain Troy Deeney was dismissed for an elbow on Lucas Torreira. Xhaka spoke after the game about the performance and what this result could mean in the grand scheme of things. This victory was Arsenal's first on the road in the league since the start of February and this was also the Gunners' first clean sheet away from home in the league this season. Xhaka said this on the performance and what it means for the team. He said: "You see how the table before the game and it shows how important this result because we didn't beat Everton and this put pressure on us. "It was not our best game but the first clean sheet away, three points is the most important thing." Arsenal proved many doubters wrong with this victory against Watford and Xhaka spoke about how big these three points are, saying: "We take a lot of points at home and not away, and I think now at the end of the season we needed those three points today and we are happy to get the points." Arsenal face four games in the space of 10 days but Xhaka is pleased with this as it means they can keep the momentum going. He said: "Yeah it is great [to have so many matches], we have three away and one at home I think and that one home is Crystal Palace which is not easy but we have to try and take the three points." Following this game, Arsenal face a tough trip to Naples to face Napoli in the 2nd leg of their Europa League Quarter-final and then a tough game at home to Crystal Palace. Xhaka was confident ahead of the trip to Italy saying: "We have a good result at home, 2-0, but it will not be so easy in Napoli and you see how Liverpool and PSG struggled there. "They have a good team, especially with the fans but 2-0 is a good result and I think we can go to the semi-final. This weekend could see Arsenal go above their North London rivals Tottenham if the results go their way. However, Xhaka was quick to say that this result was the biggest, as he said: "I think today was the bigger result, we had a big chance to go above when we played Everton but today we did go back into fourth. We are two points clear of United and have one less game than Chelsea, and we are only one point behind Tottenham. "Tottenham play against City at the weekend and this weekend is going to be massive for us."